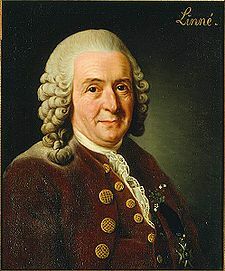 Karl von Linné, or (according to the antiquated habit fashion of Latinising eminent names still retained) Linnæus, the distinguished Swedish naturalist, and the most eminent name in botanical literature, in a notable manner arrived at his destined immortality in spite of friends and fortune. Prophesies do not always fulfil themselves, and the estimate of his teachers that he was a hopeless "blockhead," and the prediction that he would be of no intellectual worth in the world (they had advised his parents to apprentice him to a handicraft trade), are a conspicuous instance of the falsification of prophecy. After one year's course of study at the University of Lund - where he had access to a good library and collections of natural history - he proceeded to the Univeristy of Upsala. There, upon an allowance by his father of £8 a year to meet all his expenses of living, he struggled desperately against the almost insuperable obstacles of extreme poverty, which forced him often to reduce his diet to one meal during the day. He was then at the ageof 20. At length, by the hospitable friendship of the professor of botany, and a small income derived from a few pupils, Linné found himself free to devote himself to the greta labour of his life. It was in the house of his host (Rudbeck) that he sketched the subject-matter of the important works he afterwards published. In 1731 he was commissioned by his university to explore the vegetable life of Lapland. Within the space of five months he traversed alone, and with slender provision, soe 4,000 miles. The result of this laborious expedition was his Flora Laponica. Three years later, with the sum of fifteen pounds, which he had with great difficuly gathered together, he set out in search of some university where he might obtain the necessary degree of doctor in medicine at the least outlay, in order to gain a living by the practice of physic. He found the object of his search in Holland. In that country he met with a hospitable reception. During his residence in Holland he came over to England, and visited the botanical collections at Oxford and Eltham, with which the Swedish savant, it seems, has not much reason to be satisfied. Returning to Sweden, he began practice as a physician at the age of 31, and he lectured, by Government appointment, upon botany and mineralogy at Stockholm. His fame had now become European. He was in correspondence with some of the most eminent scientific men throughout the world. Books and collections were sent to him from every quarter, and his pupils supplied him with the results of their explorations in the three continents. He was elected to the Professorship of Medicine at Upsala, and (a vain addition to his real titles) he was soon afterwards "enobled." The productions of his genius and industry during the twenty years from 1740 were atonishingly numerous. Besides his Systema Nature and Species Plantarum, his two most considerable works, he wrote a large number of dissertations, afterwards collected under the title of Amœnites Academicæ - "Academic Delights." Everything he wrote was received with the greatest respect by the scientific world. Upon his death the whole of the University of Upsala united in hsowing respect to his memory; sixteen doctors of medicine, old pupils, bearing the "pall," and a general mourning was ordered throughout the land of his birth.